"I must admit, until recently, I didn’t know Glebar as well as I would have liked to. That’s why I was glad to attend the grinding machine manufacturer’s open house last week to celebrate the opening of its new headquarters in Ramsey, New Jersey. 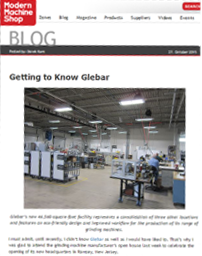 In the 1960s, [Glebar] adapted its plunge grinding technology to form billiard balls and golf ball cores....The company’s product portfolio has since expanded to include OD grinders, double-disc grinders, CNC roll rubber grinders with SCARA-robot feeding systems, CNC serrated-steel rule grinders, CAM grinding systems, dressing machines and Ferris wheel grinders..."